October has been nationally designated as Disability Awareness Month, and here at Syracuse University, the Disability Cultural Center, within the Division of Student Affairs, is partnering with constituents across campus to host a month-long series of events, conversations and programs on the topic. 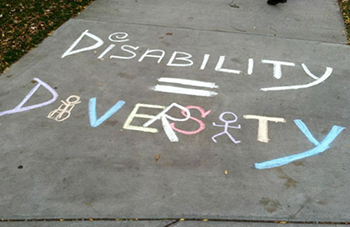 The Disability Student Union chalks the quad on Oct. 22, 2012. How, as members of society, do we create our understanding of disabilities? What factors contribute to the valuing of disabilities as identities, and as part of human diversity? Or, are disabilities, in contrast, perceived to be undesirable medical anomalies? What are the consequences of these differing perspectives? The programming throughout Disability Awareness Month provides the SU campus and local community with an opportunity to collectively and individually reflect upon our own relationships with disabilities; increase our knowledge and understanding of the practical and social aspects of disabilities; challenge our assumptions; and educate others and ourselves, through trainings, fellowship and entertainment. “It is with joy, humility and an open while reflexive mindset that the Disability Cultural Center joins with numerous partners on and off campus to help raise awareness of disabilities as part of our human tapestry, not just during October, but all year round,” says Diane R. Wiener, director of the Disability Cultural Center and a research associate professor of Cultural Foundations of Education in the School of Education. Admission to all events is free to students and the public (with the exception of the Syracuse International Film Festival on Oct. 5, which is free to students but $5 for the public). Accommodation requests can be directed to sudcc@syr.edu (queries and requests pertaining to the Syracuse International Film Festival can be directed to Dean Douglas Biklen at: dpbiklen@syr.edu). Chalking the Quad to raise awareness of “Why Disability Matters,” with members of the Disability Student Union (DSU), an undergraduate group for students with and without disabilities. 7:30 p.m., near Hendricks Chapel. For more information, contact DSU President Leah Nussbaum at lmnussba@syr.edu. Screening of “Through the Same Door,” followed by Q & A session with Micah Fialka-Feldman. Hoople Building, room 108, 7-9 p.m.; light refreshments served; American Sign Language (ASL) interpretation provided. Co-sponsored by the Disability Cultural Center, the Disability Student Union, the Disability Law Society and the Beyond Compliance Coordinating Committee. Film is closed-captioned in English. Disability Cultural Center Open House. Hoople Building, rooms 105, 106 and 108, 5-7 p.m.; light refreshments served; American Sign Language (ASL) interpretation provided; information regarding Workforce Recruitment Program (WRP) available. Syracuse International Film Festival: The Image in Disability Showcase. Watson Auditorium, 3:30 p.m.; sponsored by the School of Education. Contact Dean Douglas Biklen at: dpbiklen@syr.edu with any questions. All films are closed-captioned in English. Using Mobile Devices to Support Learning for Students with Visual Impairments (Sims Hall Atrium, Room 319); Professor Alan Foley and Department Chair Joanna Masingila will be presenting an Africa Initiative Brown Bag. This is work using mobile devices in Kenya to improve access to and quality of education for primary through university-level students with visual impairments. This work is part of the Syracuse University-Kenyatta University Partnership, funded currently by a grant from the United States Agency for International Development (USAID). What Does Queer Politics Have To Do With Disability Justice: A Keynote by Emi Koyama. October is also Coming Out Month. Keynote Emi Koyama will explore the intersections of disability justice, queer/trans* rights, and feminism through critically examining social and medical practices around ‘queer’ bodies. Followed by a Q & A and dessert reception. Watson Theater, 7 p.m.; American Sign Language (ASL) interpretation provided. Requests for accommodations and any questions can be directed to the LGBT Resource Center at lgbt@syr.edu by Oct. 9. Cosponsored by the Division of Student Affairs, the LGBT Resource Center, the Disability Cultural Center and the LGBT Studies Program and minor. Student luncheon with Ethiopian disability rights activists, Wesenyelesh Admasu of the Ethiopian Women with Disabilities National Association and Meseret Mamo Kombolcha of the Ethiopian Human Rights Commission. Noon-1:30 p.m. at Rachel’s in the Sheraton Hotel. American Sign Language (ASL) interpretation provided. Please RSVP (including any accommodations requests) to sudcc@syr.edu by Oct. 9. Cosponsored by the Disability Cultural Center, the Slutzker Center for International Services, the Disability Rights Clinic and the Disability Law and Policy Program. “Disabilities as Ways of Knowing: A Series of Creative Writing Conversations, Part 3: Lives Worth Living” with Adrienne Asch, William Peace and Stephen Kuusisto. SU College of Law, MacNaughton Hall, Room 104 at 5:30 p.m.; reception and book signing at 6:30 p.m. in Heritage Lounge, White Hall, Room 336. American Sign Language (ASL) interpretation and CART (Communication Access Realtime Translation) provided; ASL interpretation will be provided during the reception and book signing. This event is made possible by the Cocurricular Departmental Initiatives Program within the Division of Student Affairs, and cosponsored by the Disability Cultural Center, the Renee Crown University Honors Program, the Center on Human Policy, the Disability Student Union, the Beyond Compliance Coordinating Committee, the Disability Law Society and others to be confirmed. Student Luncheon with “Disabilities as Ways of Knowing, Part 3” presenters. 11:30 a.m. to 12:30 p.m. at Rachel’s in the Sheraton Hotel. American Sign Language (ASL) interpretation provided. Please RSVP (including any accommodations requests) to sudcc@syr.edu by Oct. 23. Access: The presentation space is wheelchair accessible (wheelchair-accessible bathroom on the same floor). ASL interpreter provided. Location: The Setnor Academic Building is an extension on the north side of Weiskotten Hall, 766 Irving Ave., at the intersection of Waverly and Irving, on the west side of Irving, just north of Waverly. For more information on Disability Awareness Month, contact the Disability Cultural Center at sudcc@syr.edu or 315-443-4486.